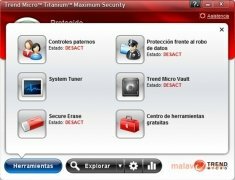 Titanium Maximum Security is a complete application by Trend Micro to manage to have total security when browsing the Internet. With this program you won't have to be afraid of the threats that beset all Internet users, because it has different tools that will protect you against any attacks. With a totally renovated interface, Titanium Maximum Security has the following categories: security summary, System Tuner and paternal controls. In the first section you will see the amount of virus and spyware, as well as the threats against the machine that the program has detected. System Tuner is the function of Titanium Maximum Security with which you will be able to tune the computer. 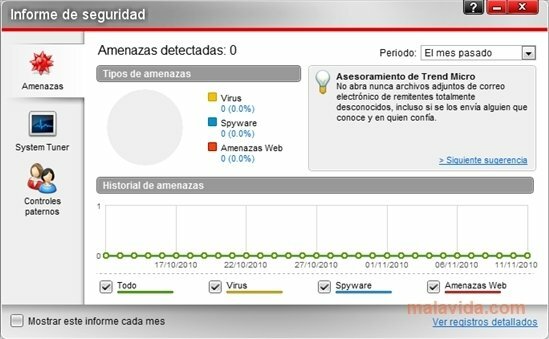 This tuning consists in programing a system analysis, the deletion of the history files and cookies, and freeing space from the hard drive. 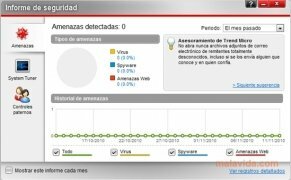 And the parental control will help you to protect your children from websites that have inadequate contents. Titanium Maximum Security allows you to apply three different kinds of analysis to the computer: fast, complete or customized. Once the system has been scanned, you will obtain a report of all the dangers it has encountered. It also has other tools to improve the performance of your computer, like an effective deletion system. Don't place your security at risk when you browse the Internet and try out Titanium Maximum Security. This download requires an active Internet connection to complete the installation. The trial period lasts for 30 days.